On 7th December 2016 the UK Department for Work and Pensions announced the planned closure of half of Glasgow’s JobCentres. These closures would have a devastating impact on communities across Glasgow and In the east end, the closures of Bridgeton JobCentre (which is in Glasgow Central constituency) and Easterhouse JobCentre will leave Shettleston as the only JobCentre location in the east end. This will put substantial pressure on JobCentre staff and the increased travel times to this JobCentre will put claimants at increased risk of being sanctioned. Answers to recent parliamentary questions suggest that UK Government ministers have no idea about the level of impact that closing these JobCentres will have on vulnerable people, with the DWP unable to tell me how many people on Income Support, Employment Support Allowance, Jobseeker’s Allowance and Universal Credit attend Bridgeton JobCentre in my constituency. 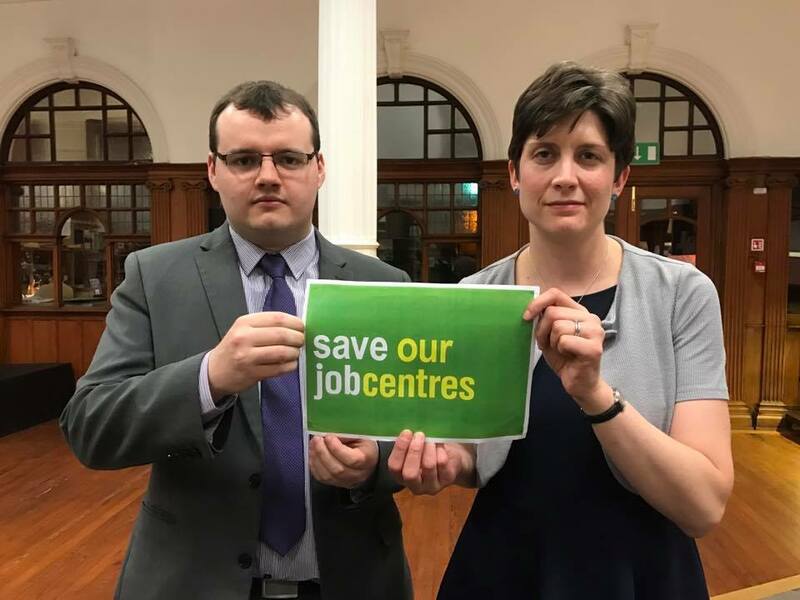 I have called on the UK Government to abandon their plans to close Glasgow’s JobCentres and I will be campaigning alongside other SNP MPs to halt the planned closures. Respond to the DWP’s consultation on the DWP’s website. Consultation closes at 5pm on Wednesday 31st January. Sign the petition below to save Bridgeton JobCentre. (please note that this petition will be presented to the House of Commons and, in accordance with parliamentary rules, only signatures of residents of Glasgow Central constituency will be presented to Parliament. You can check if you live in the Glasgow Central constituency using the UK Parliament postcode checker). Declares that the Department for Work and Pensions’ plan to close Bridgeton Jobcentre and half of all Jobcentre Plus offices in Glasgow is morally outrageous; express our concerns that the city is being used as the testing ground for more devastating cuts across the UK; further that the proposals to close eight of the 16 Jobcentre offices across Glasgow, will impact on tens of thousands of people in receipt of Jobseeker’s Allowance, Employment Support Allowance and Universal Credit; further that the UK Government has already indicated that 20% of the JobCentre estate will see closures, and Glasgow has been handpicked to take a disproportionate hit of 50% closures; further that it will result in the poorest communities not being serviced by a JobCentre and make it even harder for those seeking employment to get support; further that thousands of people could also have to travel further at additional cost to attend their appointments; further that the UK Government have brought forward these proposals without carrying out an Equality Impact Assessment and without consulting the Scottish Government; and further that any Jobcentre closures in Glasgow will see one of the most deprived parts of the UK starved of a vital service that should be available in communities; impacting both on Scottish workers at these centres and also those most disadvantaged in need of benefits. The petitioners therefore request that the House of Commons urges the Government to halt any moves to close Bridgeton Jobcentre, or at the very least carry out an Equality Impact Assessment immediately prior to a full public consultation across Scotland. And the Petitioners remains, etc. (Alison Thewliss MP would like to use the details you provide to keep you up to date about this campaign and future campaigns. If you are happy to be contacted in this way please tick the mailing list box next to your signature above).